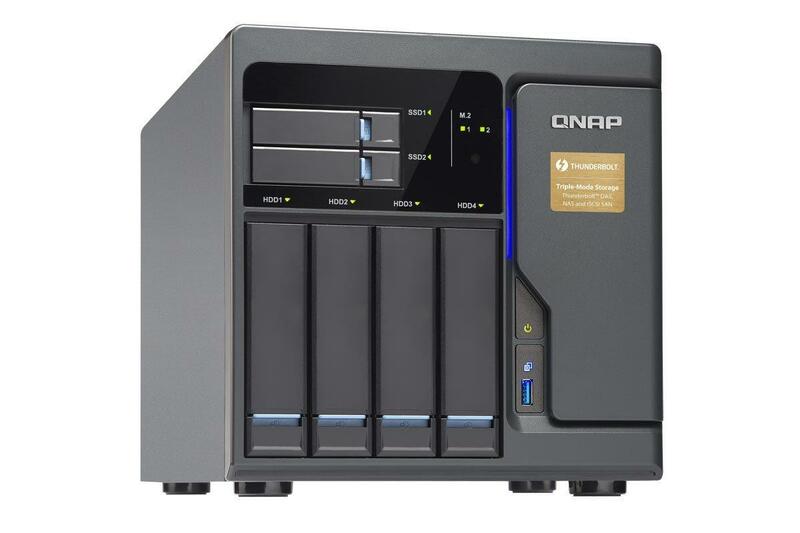 QNAP’s TVS-682T ($1,895 on Amazon) is a business-class storage device that’s best suited to business and high demand video editing environments. While it offers more horsepower than needed for most home users wanting media hosting or a file server, it offers excellent media and file serving tools that are so simple that someone with limited network, server, and storage experience will be able to use and manage it. The TVS-682T is powered by an Intel Core i3 processor. It also has four memory slots, two of which QNAP fills with with 8GB of DDR4 RAM, and which you can fill with up to 64GB of RAM. There are also six drive bays, two designed for 2.5-inch SSDs and four that support both 2.5-inch and 3.5-inch drives. The devices also has up to six ethernet connectors (two 10GBaseT ports and four gigabit ports) three HDMI ports, two Thunderbolt 2 ports, and five USB 3 ports. (Note: the unit QNAP shipped to me for review did not have the 10GBaseT or Thunderbolt cards installed.) In short, the TVS-682T offers everything you need to get your files or your multimedia, stored and shared on your computer, local network, or across the Internet. QNAP setup is very simple. After you unwrap the box, plug it in to your network and power it on, you use QNAP’s web-based setup site (start.qnap.com) and your device’s unique setup key to kick off the setup process. 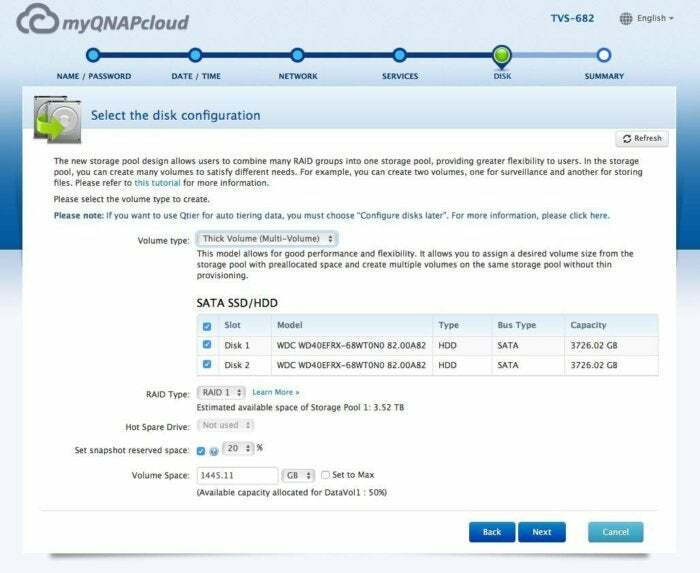 You’re asked to create a QNAP account for managing your devices and to set up an administrative account on your QNAP server. Once complete, the server will check for OS updates and update applications that are a part of that core OS. QNAP takes you step-by-step to set up the software that manages the TVS-682T. If you’re familiar with iOS you’ll have no problem working your way around QTS 4.3, which is what QNAP calls their OS. It looks and feels like you’re working on a web-based version of iOS. It has a home screen complete with square icons that have rounded angles, groups created by dragging one app on top of another, and multiple home screens you can use to organize your apps. 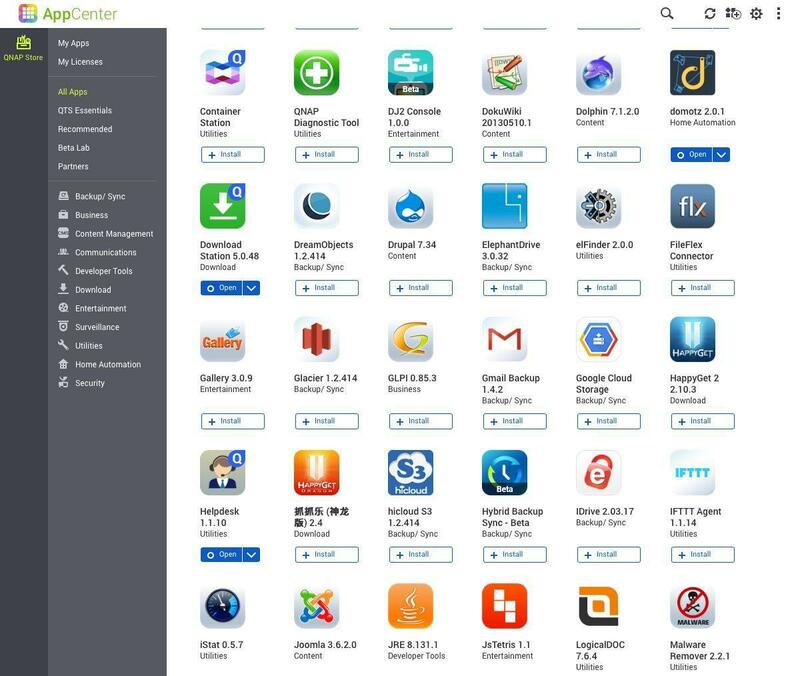 There are also apps for iOS and Android that allow you to manage your QNAP server, but the tools available in those apps are limited in scope, so you should expect to use the QTS web interface to handle all of your server management. You manage your servers settings using the QNAP control panel, an app that allows you to monitor your QNAP server, add and manage users and groups, manage network interfaces (you can bind interfaces together for redundancy and load balancing), and mange user and group access to files, folders and other system resources. There are also tools for creating virtualized computing and storage environments, which allows user storage and processes to be placed in independent containers with no access to other virtualized environments hosted on the TVS-682T. One frustration I had with how the management control panel works is that it is modal in nature. If you’re doing something like deleting an app and that process is taking a little while, you won’t be able to use the OS to do anything else while that process is taking place. Probably not a big deal in the grand scheme of things, but definitely something to keep in mind. There are over 100 apps you can install and use with the QNAP server, including everything from media servers and development tools to QNAP’s Qsync server, which works like your own personal dropbox service. QTS 4.3 seems to take its cues from iOS. That's a good thing. QNAP’s file server is up and running as soon as you finish setting up the QNAP and you have the option of hosting files using SMB, which is on by default, and AFP and NFS. The latter protocols need to be turned on to use. The OS includes a built-in Time Machine backup server, but the software has not been updated to allow Time Machine backups over SMB, which macOS supports as of Sierra. QNAPs media servers work quite well. In fact, my television recognized that I had a QNAP media server without me having to configure the TV to see it. The iTunes media server was also recognized without configuration by all the Macs in my network. Likewise. All that was necessary to start playing music or moves was to drop media files into the appropriate folders on the server. The TVS-682T works well as a media server. The QNAP TVS-682T is a powerful server, versatile, and capable of handling anything a home user might throw at it for hosting media files. As a standalone server in a business environment, anyone from video editors to small business IT managers will find that the TVS-682T is more than sufficient to match the demands of a small business environment.